Benefits related to Earth resources, technology, and new products. Design a collector's card, with a picture on the front and information on the back, about your favorite space pioneer. Share your card and discuss four other space pioneers with your counselor. How satellite pictures of Earth and pictures of other planets are made and transmitted. Discuss with your counselor a robotic space exploration mission and a historic crewed mission. Tell about each mission's major discoveries, its importance, and what was learned from it about the planets, moons, or regions of space explored. Using magazine photographs, news clippings, and electronic articles (such as from the Internet), make a scrapbook about a current planetary mission. Design a robotic mission to another planet or moon that will return samples of its surface to Earth. Name the planet or moon your spacecraft will visit. Show how your design will cope with the conditions of the planet's or moon's environment. 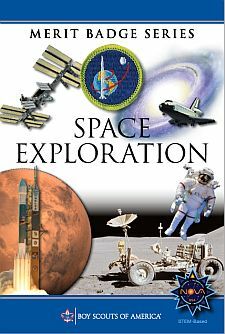 Discuss with your counselor two possible careers in space exploration that interest you. Find out the qualifications, education, and preparation required and discuss the major responsibilities of those positions. * If local laws prohibit the launching of model rockets, do the following activity: Make a model of a NASA rocket. Explain the functions of the parts. Give the history of the rocket.